This recipe immediately caught my eye. 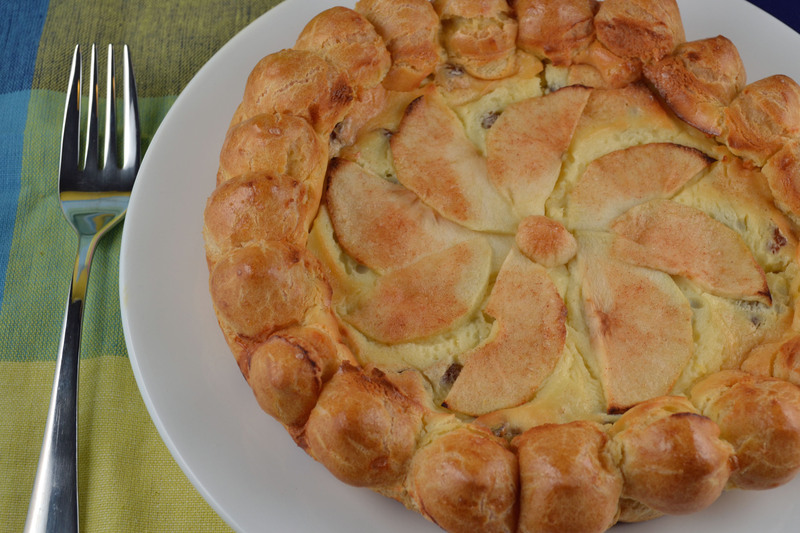 Apples, pate a choux, and cheese cake filling meet in one inspiring cake puff. I’ve never seen a recipe quite like it. Apple season is in full swing and I find cheese cake hard to resist so it seemed this recipe from “The Art of Fine Baking” was calling out to me. The result is impressive but must be devoured quickly due to the short life of the puff portion of the cake. I made two sizes of this cake puff. The larger version follows the original recipe instructions and I improvised to make the smaller one using leftovers. I can’t help but feel like the puffed border of the large one could be over-the-top delicious if filled with sweetened whipped cream- like a cream puff apple cheese cake puff…whoa. 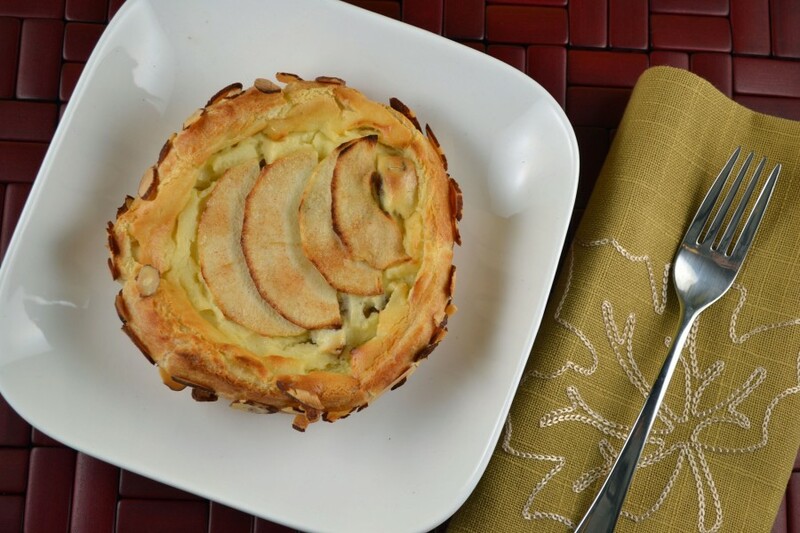 But as is, the lemon zest in the cheese cake filling brings out the fresh tartness of the apple and provides a delicate contrast to its puffed shell. Another Paula Peck show stopper. Mix raisins with cognac. Cream together cheese, sugar, and flour. Stir in egg yolk, then melted butter, sour cream, lemon zest, and vanilla. Mix in raisins. Trace a 8-inch circle in flour on a parchment lined baking sheet, using a plate or pan as a pattern. Turn parchment paper over. Spread a thin layer of pate a choux about 1/4 inch thick within the circle. Place remaining pate a choux in a pastry bag fitted with a plain round tube. Squeeze out small mounds of paste, one right next to the other, to make a low border around the layer. Pour cheese filling into center of shell. Spread evenly. Arrange sliced apples on top. Sprinkle with cinnamon sugar. Brush border with egg yolk mixture. Sprinkle with almonds (if using). Bake in preheated oven 50-60 minutes or until entire pastry is golden brown. Use pastry tip to pipe a spiral, starting in the center, about four inches wide. This creates the bottom layer so make sure there are no holes in the pate a choux. Pipe a second layer just around the rim of the spiral, creating a border. Spread cheese filling in center as instructed above. Bake about 30 minutes.